I am a terrible app reviewer. Maybe that is a bit harsh. I am a terribly tardy app reviewer. That’s better. At the beginning of this month, I was given a copy of ROCK BAND Reloaded to review for this site, so I dove right in and played it like there was no tomorrow. Then I took a break from the game for a while as a few other new releases came out, and I wanted to give them a shot, knowing that Rock Band was waiting for me no matter how bad these games were. This cycle endured for nearly a month, until I finally decided to sit down and write this review. ROCK BAND Reloaded is a great game. Really that sums up the entire game and it should totally be the perfect review. Alas, that simple statement is not going to make you, the dear reader (and fellow app addict) open up your App Store and purchase it on my one sentence judgment. So let’s get the first part out of the way, the biggest detractor: The Price. This app is not $0.99, it is currently $4.99, however I believe is normally priced at $6.99. This usually means it had better be fantastic or the almighty Internet iDevice Community (which is now to be referred to as the IiDC, pronounced “Double-Eye Dee Cee”) will rise up and boycott the game with its friends for being a ripoff. Well actually I am sure some of the IiDC will be doing this anyways since many feel anything over $0.99 or isn’t free is a scam and unfair to the users. Funny thing though, these apps still sell like iHotcakes, as long as they are of decent quality. It comes down to this: If we want top-tier games with talented developers that do more than port unbelievably horrid flash-based games and throw them on the already overloaded app store simply to make a quick buck, we all will have to pay more. The game is quite packed full of features for the asking price, and rivals what is offered by the Nintendo DS and Sony PSP. That all said, the musical content that is included in the game is quite impressive, which brings us to the next point. If you are already a Harmonix/Rock Band fan, you will recognize many of these free tracks as being from Harmonix bands. Some are great, some are alright, but again, in the end it all comes down to personal taste. As usual, there are quite a few downloadable songs which will run you $0.99 for each two-pack. Now if you downloaded songs for the original iOS Rock Band game, I am sad to inform you that they will not work with the new title. It seems like a compatibility issue more than a “we want more money” issue, as the game is played in a whole new fashion than the previous game. ROCK BAND Reloaded is played in a similar manner to the original ROCK BAND iPhone game. This is what Harmonix does best, which is making elegant solutions to solve complex issues. Well, that and having awesome hair. They win in that department. Obviously having no hardware guitar or drum set, you will find yourself tapping away as colored bars fall down the screen, indicating which virtual button to tap. This works well, and is one of those “if it ain’t broke, don’t fix it” things. There is no need to play with the formula that has worked so well in the past. However, for those who played the original game, their poor cramped and pained hands are treated to the oft-begged update, where you play this game in landscape mode rather than portrait. This gives your hands a more natural “controller” feel where you think less about dropping your iDevice, and more on enjoying the game in front of you. The other new addition is Vocals. Yes real-world “sing with your mouth” vocals. Many people say they wouldn’t be caught dead singing into an iDevice, but this is really the kind of game that benefits from extended uninterrupted play sessions, especially at home. If you have an iPhone you just select vocals from the menu and sing to your heart’s content. If you are like me and simply have a last generation iPod, you will need to find a microphone adapter for your device. 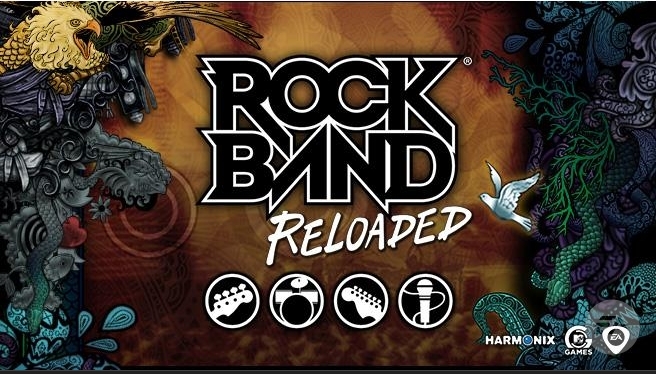 I am not sure which specific ones worth with ROCK BAND Reloaded, as I haven’t found one other than online myself, so I can’t really say how the vocals work first-hand, but I have spoken with a few iPhone owners and they said it works just as well as the video games on the consoles. The option is there to play via taps instead, similar to the first game, which must be noted plays in portrait mode unlike the rest of the instruments. The game is more focused on World Tour mode than the first game was. World Tour is the mode where you unlock new songs and arenas by gaining fans and stars. It works pretty well and the interface is improved over the previous game significantly. I found it much easier to browse and select songs as well as see what high scores have been recorded. Again, the horizontal orientation is a big help for the interface. Personally, I find the argument over which music game has better graphics to be pointless. As long as I can clearly see the notes and it moves at a good frame rate, I am satisfied. ROCK BAND Reloaded is a much smoother gameplay experience than its predecessor. This is probably due to the removal of the pre-rendered band animation loops which have been replaced with still images of a band rocking out that change every couple seconds. At first this was slightly jarring, but the images quickly and easily were ignored and focus on the vibrant notes relentlessly coming down the highway. As you may have guessed, you don’t actually create your own band. In fact you don’t create anything yourself. The total lack of customization is disappointing, but not really upsetting enough to pass on the entire game. A few track packs have already been released, and are pretty solid choices. As long as EA supports the game with more downloadable songs than the first game, ROCK BAND Reloaded will remain on my device for a long time. The leaderboards are directly integrated into the game now, and you can see who the top players are when you choose your song. The online scoring does require you to be logged into Facebook, so if you are not a member, this won’t be available to you. Another nice feature is the addition of extensive challenges and achievements as well as 4 difficulties instead of the previous 3. There is no type of social gaming network integration at the time of this writing, which is a shame since it seems natural to include Game Center in this type of game. Overall, it comes down to the same things I say about most sequels and decent remakes: If you loved the original game this is a must-buy. If you are trying to decide between the two, compare the song lists and features to make your decision. Both play nearly identically, and both are great purchases. I would give the tiebreaker to Reloaded simply for the horizontal orientation, it is just more comfortable to hold for longer. The game is probably the best music game experience available on the device, with a stellar level of polish that sets it apart from other well-done rhythm games out there, as well as a more varied mainstream mix of music. Enjoy your music and let’s hope EA and Harmonix keep on Rockin’ with songs and updates for this game for a long time to come.